Blondie and Brownie: Books + Us + Vendors + Stories!!!! Books + Us + Vendors + Stories!!!! It's been gorgeous out! 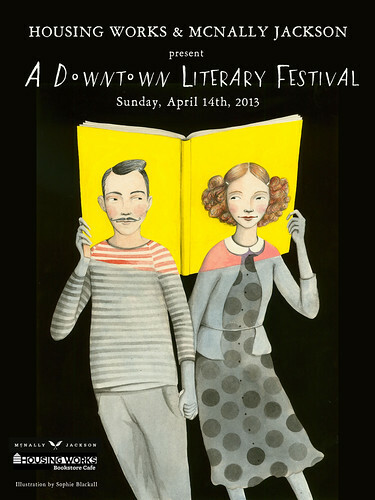 So, what better way to spend a Sunday afternoon than downtown being smarts and hitting up a literary festival downtown? Well, we'll be there! With vendors! And food! And dirty gossip about life as a street vendor! Around 1:30p, we're sitting down at Housing Works Bookstore Cafe with Red Hook Food Vendors Executive Director, Cesar Fuentes, and Vendy award finalists Nick Karagiorgos, second generation owner of Midtown's Uncle Gussy's Greek Truck; Fauzia Abdur-Rahman from Bronx-based Fauzia's Heavenly Delights' and Jonathan Hernandez from uptown's Patacon Pisao; to discuss, well, life as a street vendor. Of course, we're not the only food-related part of the day, the owners of Russ & Daughters will be at the Cafe earlier while dishing with DISH at 11:30a. You might see us there. Or at the section afterwards involving learning literary pieces to recite. Or shopping for books. Or eating! Oh my goodness, so many things. Here's the full website with the day's schedule, *and* here's the Facebook event specifically for us! RSVP is the way to be! Catch Us at Rock Center Tomorrow! Happy Book Birthday to Us!